This is a smoky, spicy, appetizing take on Buffalo wings. You can make it as hot or mild as you like. It makes a tantalizing appetizer or a delicious side. 1 medium head fresh cauliflower leaves removed. 3 Tablespoons extra- virgin olive oil divided. 1/2 cup hot sauce such as Frank's Buffalo Style Wing Sauce we didn't have Franks' but we did have Cholula and it was very good. Kosher salt and ground black pepper. Arrange rack in the middle the oven and heat oven to 375 F.
Cut the stalk end off the cauliflower so that the head sits flat. Place it on a foiled lined baking sheet. Rub 2 Tablespoons of olive oil over the cauliflower, season to taste with salt and pepper. Roast until the outside starts to brown, about 25-35 minutes. In large, deep sautè pan over moderate heat, heat the remaining 1 Tablespoon of olive oil. Add the cauliflower florets, season to taste with salt, pepper, and smoked paprika. Sautè until heated through and the cut sides start to brown, about 5 minutes. Shake sauce over the florets and continue to cook. The heat of the bites will depend on how much sauce you put on. Continue sautèing until both the cauliflower and the sauce are hot, about 5 minutes. If not serving right away keep warm in a 190F. oven. 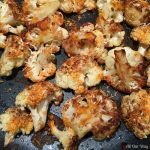 ***The cauliflower can be roasted ahead of time and cut into florets. Cover the florets and keep them in the fridge until ready to use. They may need to sautè longer if refrigerated.